Indulge in our ultra premium chocolate ice cream! 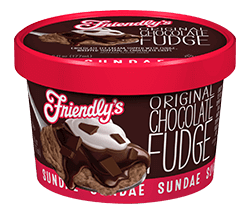 Our Original Chocolate Fudge Sundae is covered with fudge, topped with whipped topping and semi-sweet chocolate chips—all in one perfect single serving sundae cup! Milk, Cream, Skim Milk, Sugar, Corn Syrup,Cocoa (Processed With Alkali),High Fructose Corn Syrup,Hydrogenated Vegetable Oil (Palm Kernel,Soybean) With Soya Lecithin,Whey Protein Concentrate, Whey,Partially Hydrogenated Palm Kernel Oil, Chocolate, Phosphoric Acid, Dextrose, Guar Gum, Mono And Diglycerides, Salt, Xanthan Gum, Cocoa Butter, Soy Lecithin, Sodium Caseinate, Soy Protein Isolate, Polysorbate 60,Carbohydrate Gum,Polyglycerolesthers Of Fatty Acids,Artificial Flavor, Sodium Citrate, Vanilla Extract, Chocolate (Processed With Alkali),Carrageenan.